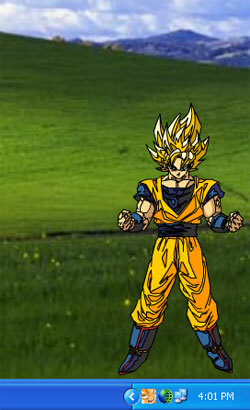 Dragonball Z Desktop Buddy uses animated cartoon Dragonball Z characters display on your desktop. Your desktop buddy displays your favorite Dragonball Z friends such as: Goku Gohan Goten Krillin Trunks Cell Frieza and lots more! If you are a Dragonball Z fan you owe it to yourself to get this! Download it for free now! Qweas is providing links to Dragonball Z Desktop Buddy 1.0 as a courtesy, and makes no representations regarding Dragonball Z Desktop Buddy or any other applications or any information related thereto. Any questions, complaints or claims regarding this application Dragonball Z Desktop Buddy 1.0 must be directed to the appropriate software vendor. You may click the publisher link of Dragonball Z Desktop Buddy on the top of this page to get more details about the vendor.